Are you already getting a bit of tired of my Korean skin care products? I’m not, because skin care is something I love to use and it is important to achieve the best results applying makeup. Korea is the first country to release innovative new (weird) beauty items most of the time. That’s why I get excited when it releases crazy or cute-looking new items! This time I got products from Wishformula! It was so kind to send me three amazing items to try, thank you so much. The items and the way they were packed were very cute! Well, let’s see what I’ve got! 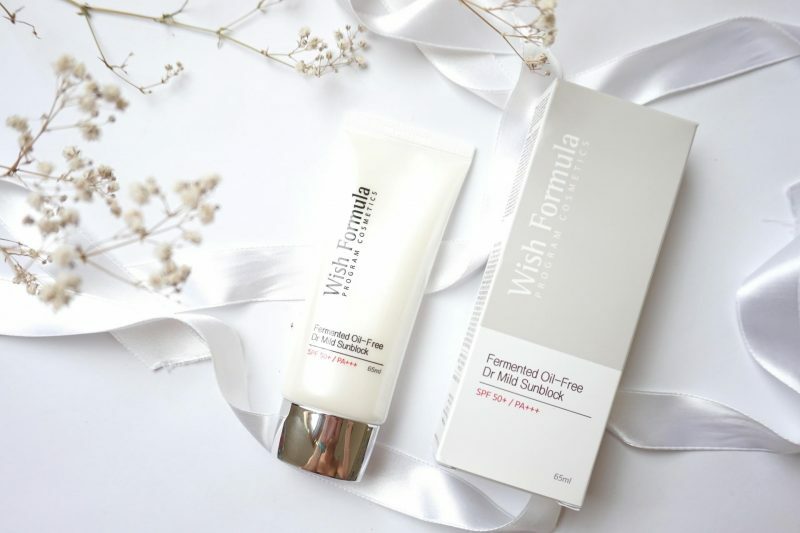 Wishformula is a Korean Skincare brand which makes its products by natural processing unlike other chemical cosmetics. It says that if you produce without any chemical processing, it will maximize the active ingredients while removing harmful toxins and allergy inducing materials. WishFormula sells its products on Wishformula.me and Instagram (you can order by sending a DM). 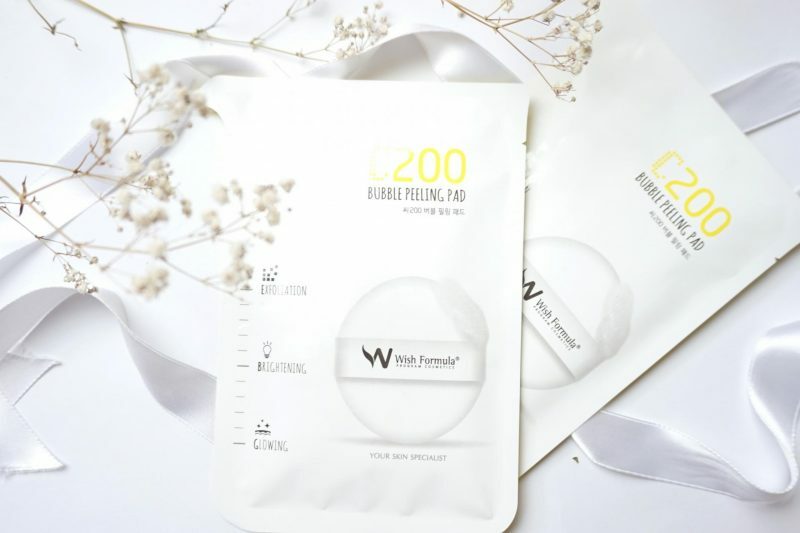 The Bubble Peeling Pad is a facial pad that exfoliates and brightens your skin, resulting in a glowing, smooth face, ready for applying skin care on and starting your day or night routine! Your scars will clear up over time when using this regularly and the cell turnover will increase. This item is great for boosting your skin and making it look new again in a fun way! I was already familiar with Starskin’s Bubble Peeling Pad, so I knew what to expect from this one. There are Korean and English instructions on how to use the Bubble Peeling Pad on the back of the packaging, thank god! No more struggling with finding out how to use the product. The pad is already infused with the product, so you only need to give it a few squeezes before the product shows up on the pad. Then you need to use the pad for 2-3 minutes on the face and neck and make circular motions. Wash your face afterwards and use the back of the pad (the side of the ribbon) to let the product sink into the skin. I skipped the last part, because I rubbed the pad for a good amount of time, so I didn’t need to let the product sink into my skin. The product has a citrus smell because of the Vitamin C. The smell isn’t overwhelming. The pad has a ribbon for holding the pad easily while making circular motions. The rough side is for exfoliation, while the soft side is for tapping the product into the skin. I was surprised by its gentleness when I tried it. The Vitamin C didn’t irritate my skin and the pad was easy to use. The only thing that bothered me was that I had to squeeze the pad after 1-1.5 minutes because it lost its foam, while the Starskin Peeling Pad didn’t have this problem. I rinsed my face after I’d rubbed it for about 2-3 minutes. I immediately noticed that my face was brighter and smoother than before. I did have a few dry patches because I was rubbing my face for too long. So if you have sensitive skin, I recommend you to use the pad for 1-2 minutes. For the last couple of months I’ve been trying to include a sunscreen item in my daily skin care routine to prevent my skin from aging. This sunscreen came at the right time! It has SPF 50+ and PA+++. The following may sound weird, but I only use sunscreens above SPF 50, because I want to get the maximum amount of protection! This sunscreen is oil free which is perfect for my super greasy skin! It is like Wishformula has read my blogs to find out which kind of products it had to send me. The sunscreen contains a generous amount of product (65ml) which is enough for the entire summer if you’re using for the face. The packaging looks sleek and the box contains an English description. I’m sure that I don’t need to tell you how to use sunscreen. Just apply a generous amount on the face and blend it out with your fingers or a brush. I used this sunscreen on my bare face and on top of my makeup. I have to say that this sunscreen does an amazing job when it has makeup on top! 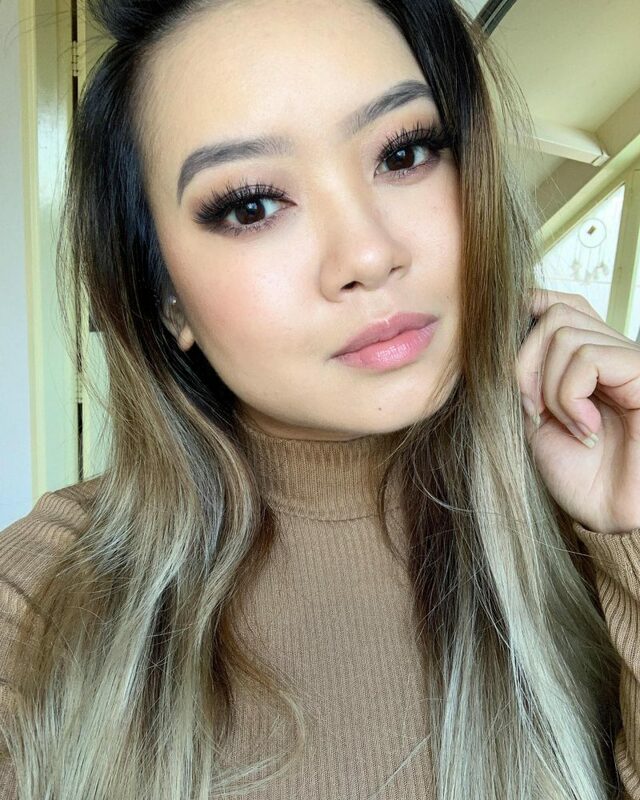 It even feels like it makes the makeup “stick” on the skin without making the skin oily, which is a big deal for my super oily skin! It has a typical sunscreen smell, but it isn’t the usual overwhelming smell. It blends well and doesn’t leave a white cast behind. I think I’ve found my new favorite sunscreen! These pads are infused with AHA, Vitamin C, B3 and B5. They are the cotton pad version of the C200 Bubble Peeling Pad. The only difference is that you don’t need to wash your face after you’ve used the pads. They will gently support the natural oil turnover and make your skin moisturized and glowy. Great for a quick skin care routine, because the pads are already infused with the ingredients; you only need to grab the pad with the tweezers that come with the jar! Many brands have launched their exfoliating pads, which are the new trend for getting a quick and easy skin care routine. Brands like Cosrx and The First Aid have a similar item which has the same goal: exfoliating the skin and nourishing it at the same time. 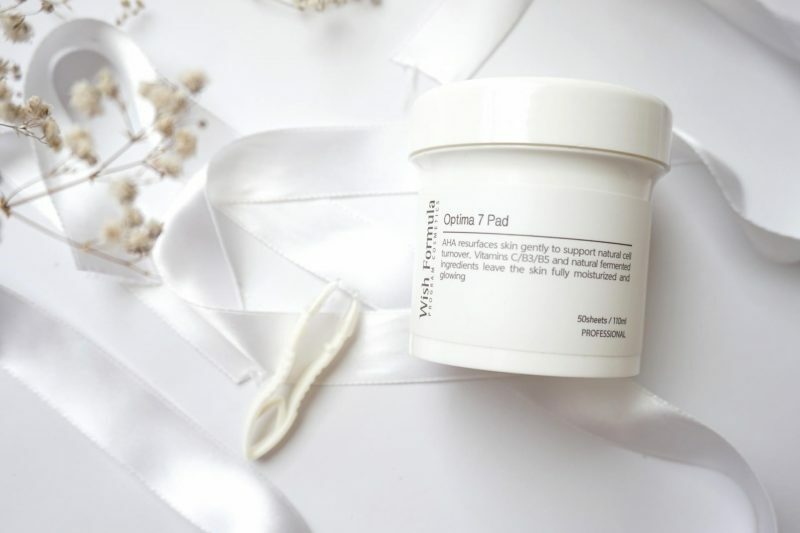 This kind of pad is especially designed for troubled skin that is prone to acne. It will make your pimples dry up. The right way to use an exfoliating pad is grabbing one with the tweezers and wiping your face with it. I use rotating motions with the pads to really work them into the skin. This cotton pad has a different result. My face looks brighter in the morning but the pad doesn’t do anything for my blemishes or visible spots. It’s easy to use, but I don’t really enjoy using it because of the scent. It has an intruding chemical, fruity smell which has to do with its ingredients. The smell is something you have to take into account when you want to get this product. However, I experience this smell with all of my Vitamin C products, so I’m not blaming Wishformula! I prefer using the C200 Bubble Peeling Pad rather than using the Optima 7 Pad. Overall, I’m really happy with these items. I feel honored that I could try these Korean products! My favorite product is definitely the sunscreen! I’d totally recommend it to everyone. I didn’t stop using it after I received it, that’s how much I loved it. It has replaced my Innisfree Waterproof SPF 50/PA+++ sunscreen which has been a long-time favorite of mine. It has a great finish when you smudge it out on your face, and it makes my makeup last long without making my skin oily! That is a big deal for a sunscreen item, because sunscreen usually makes your skin even more oily than it initially was. I’m a bit disappointed by the Optima 7 Pads. I have to say that I didn’t use these pads for a long time. I might get better results when I do. The pads made my skin brighter in the morning though, so it’s not true that they don’t do anything for your skin. 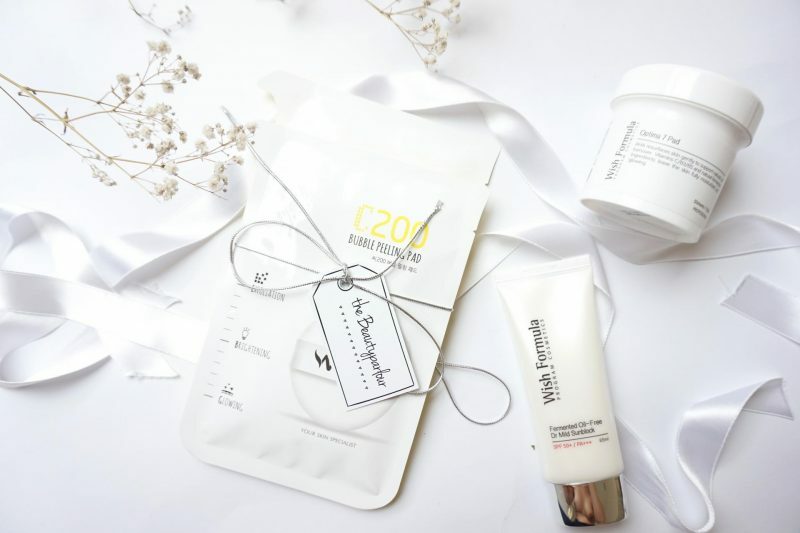 The C200 Bubble Peeling Pad is a fun item to use which makes your skin softer, glowy and brighter. It works well on me, but it feels a bit too harsh on the skin sometimes, since I have an oily skin. Do any of these products interest you? Order your items at Wishformula’s official Instagram by sending a DM! Which product would you choose? How awesome that they sent you these to try! The Bubble Peeling Pad reminds me of the applicators inside a cushion compact (which I guess makes some sense since those are also a K Beauty phenomenon). I love innovative and interesting products like that. They seem so fun to use! Cool dat je dit mocht testen! 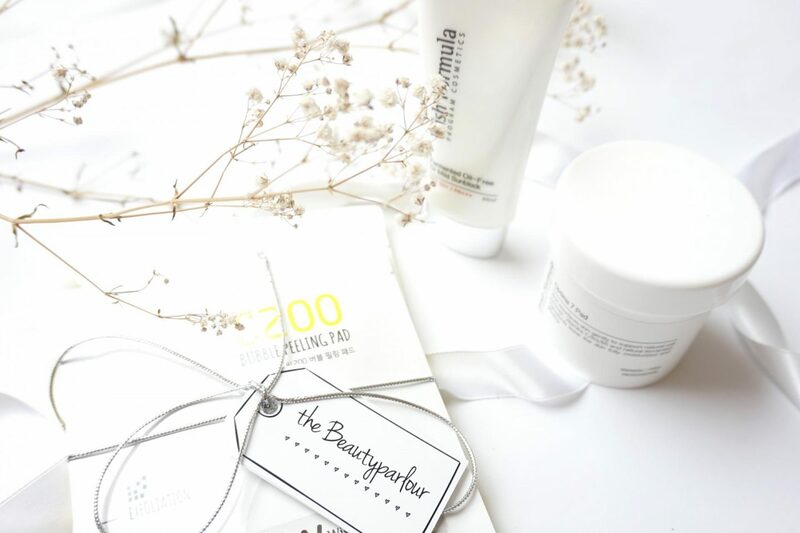 Moet me eens verdiepen in Korean Skincare, of uberhaupt skincare. Ik reinig s’avonds m’n gezicht en doe wat dagcreme op in de ochtend en that’s it. Vooral die bubble peeling pad klinkt wel interessant!